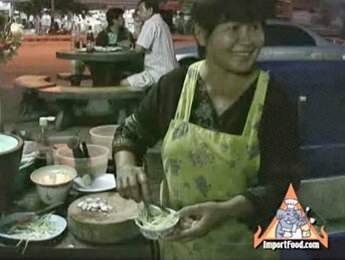 In this recipe, we prepare freshwater fish in a unique way that is sometimes translated as "Cotton Fish Salad". Prepared in this simple, unique style, the fish puffs up like cotton. In Thai the translation: pla = fish; dook = freshwater fish species similar to catfish (but catfish in Thai is pla chon, so dook is distinctly different); foo = puff up. Granny Smith apples, peeled and cut into matchsticks, works just fine for this recipe. In Thailand green, sour mango are used. Sour mangoes are available on a seasonal basis in the United States, grown in Puerto Rico. For making this at home, use catfish for excellent results, but we like using local trout as in this recipe. We've also made this with canned tuna fish (drained well), which tastes great. See our recipe for Pla Dook Foo here. Also, see the link below to a sidewalk chef in Thailand making this the in the authentic method. We hope you might try making this at home. Cook the fish on a barbeque or, as we did, in the oven. Remove the head, tail, and pull the bones out as much as possible. Vigorously pound the fish in a mortar and pestle. The more you pound it, the better the result. Take your time and really pulverize your fish. Put the pounded fish into a skillet or cooking pot with hot oil. It cooks after just a minute or two. Place on a dish (with head and tail in place, in the traditional manner). Place some peanuts on the fish, then top with a mixture of shredded green mango, sliced shallot, sliced Thai chile peppers, fish sauce and lime juice. A note on the tools of the trade: our mango peeler, and Miracle Knife, work wonders on the mango. My all time favorite dish, one serving is never enough. I've made it sometimes when I could not find green mango by substituting slices of clemintines and cashews rather than peanuts. this dish is so delicious, but i find it's not easy to make. it is very difficult to get the fish to fry into a nice cake. 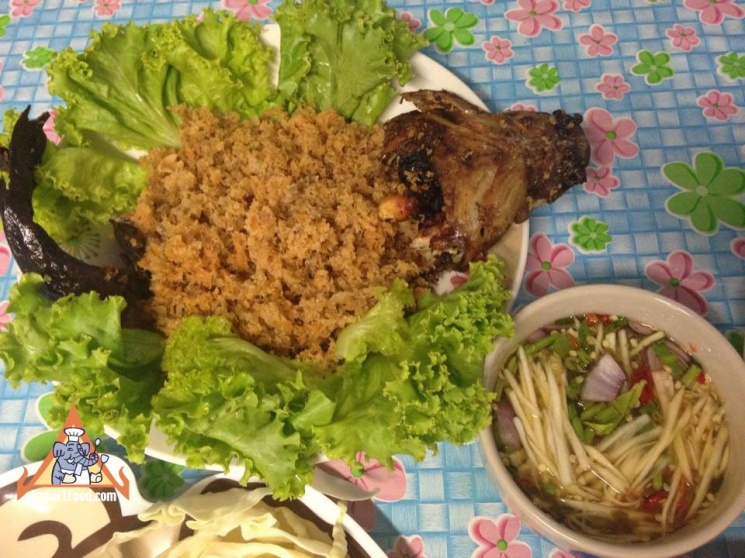 also, plaa duk is in fact catfish; plaa chon is snakehead fish or mud fish.